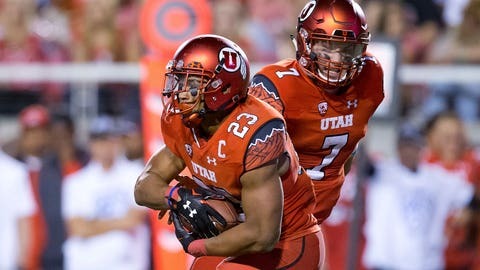 Running back Devontae Booker and quarterback Travis Wilson lead a punishing Utah offense. TEMPE, Ariz. — For the second time this season, the Arizona State football team will go on the road to take on a top-ten opponent. The Sun Devils will be in their most hostile environment yet as they take on No. 4 Utah in Rice-Eccles Stadium in Salt Lake City. The game is the 35th consecutive sellout for Utah. "The biggest challenge this week is focusing on ourselves. This is a huge game. It’s going to be a great atmosphere, getting to go play on the road the No. 4 team in the country," Arizona State offensive coordinator Mike Norvell said. "But the No. 1 focus has got to be us." The Sun Devils are a perfect 4-0 against Utah since the Utes joined the Pac-12 in 2011. The last two games against them, however, have been decided by a combined four points. "It’s probably one of the teams in this league I’ve got the most respect for. When you turn on the film, every week they’re going to come play," Norvell said. "They’re very aggressive; aggressive in their style, aggressive in their nature. This is one of my favorite games to be a part of." TURNOVER BATTLE: The Utes are tied for first in FBS with a plus-two turnover per game margin. The Sun Devils, on the other hand, rank last in the Pac-12 at minus-two. "The team that’s the most physical, the team that’s able to run the football, and the team that protects the ball is usually the one that wins," Norvell said. "I know they’re going to be jacked up. We’ve been in those games. We’ve been in those situations, and now it’s just time for us to go play and make sure our communication is on point." Arizona State led the Pac-12 in turnover margin in 2013 and ranked second last year. "A big point of emphasis is that we cannot put the ball in jeopardy," Norvell said. "That’s something that we’re continuing to strive to do but we still haven’t played a game where we’ve been at 100 percent ball security." BRACING FOR BOOKER: Utes running back Devontae Booker shoulders a big offensive load. He’s carrying the ball an average of 28 times this season, and also gets about four catches a game. "The biggest difference in Booker this year, compared to last year, is they’re throwing the ball to him quickly out of the back field," defensive coordinator Keith Patterson said. "When he catches the ball out in space, now you’ve got issues. You’ve got to make sure you gang tackle, swarm tackle him. That’s the biggest difference I see in their team." Utes quarterback Travis Wilson and Booker have combined to rush for 914 yards and nine touchdowns. "It starts with those two guys. You have to stop the run with No. 7 (Wilson) and No. 23 (Booker)," Patterson said. "Then once you do that, obviously you have to stay sound vertically. Don’t let people get behind you, and then tackle well." UPDATE ON INJURIES: Running back Demario Richard was in a green, no-contact jersey, but is expected to play. Richard hurt his knee in last Saturday’s win over Colorado. "Demario is coming along," Norvell said. "He got a little banged up in the game. He was out there today getting some work in so we’ll see where he is at as the week continues to progress." Wide receiver Fred Gammage is expected to get his first playing time of the season against Utah. "We tried to get him rolling last week, but it wasn’t quite there yet," Norvell said. "I think we can expect to see him out there which will really help. Fred’s a guy â he’s kind of a do everything receiver for us â he can play almost every spot."